Welcome to the Monday edition of the Marketing for Owners Podcast. Today’s episode is sponsored by Marketingforowners.com/71 (not really but you should go have a look at this free e-book full of useful marketing tools). 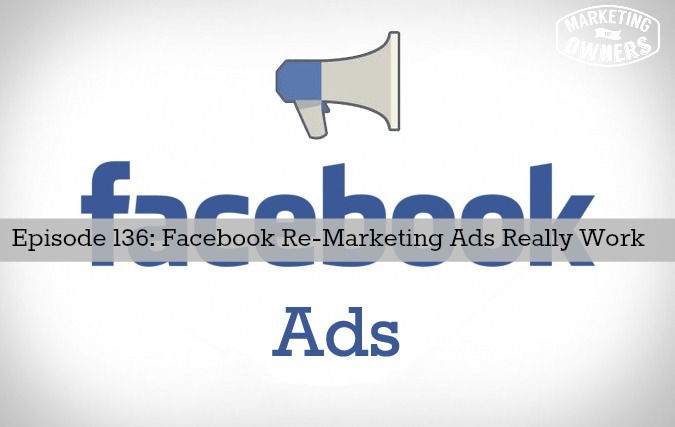 Today we are talking Facebook marketing and how those ads work — do they really work? Awhile back, you may remember Episode 34 podcast I did about Facebook marketing and the Emperor’s New Clothes (just click that link and you can go right to that podcast). People are addicted to Facebook — we all are, but we want it to help us to be successful in our businesses. We start by building our page and posting here and there, but no one is seeing the things we post. Then Facebook announced that they were no longer going to show our stuff to anyone. Now, that’s fine by me because I do pay to play. In our e-commerce business, we extensively use Google Adwords. Without Google Adwords, we would not be where we are today. And you know what? Facebook ads are killing it right now. They are brilliant for marketing, but only if they are done correctly. Quite often you will post something on your Facebook business page and if you notice at the bottom, it says “boost post”. That is something you pay for and a lot of people just click, but noooo! That is NOT the best way to use Facebook ads. Hitting that boost post just to get people to click like is NOT why that is there. Re-marketing is where it’s at. I’m not going to go into full detail about what re-marketing is. If you knew the full definition of what re-marketing is, you would probably not want to implement this process. Let’s say you have been on Amazon and you have looked up cameras, and you discovered the Canon EOS5 so you clicked on it. Then later when you are visiting other websites, you notice all these adverts for that same camera that you clicked on earlier. You think, WOW! Look another great place to buy that camera I was looking at. That is called re-marketing or re-targeting. What these places have done is put a cookie on that tracks you and what you look at online. Please get over the cookie thing right now Owners because that is the way that the entire Internet works. That is how it serves up relevant information. That is how it knows something about you, because the cookie tracks where you have been. Now Facebook will give you a little bit of code to put on your website. Through that, you can re-market. If someone comes to your website and then they leave, you have the ability to track that through the Facebook system. All the advertising people use this type of system. You can put an ad on Facebook and you can advertise to that person and put certain stipulations around it. Once you put that tracking pixel on your website, you can build a custom audience. You want one for people who have visited your website. You want to create one for the last day, the last 30 days, the last 60 days, the last 90 days, the last 120 days, and the maximum — 180 days. People who come back to your site over time are different to the people who just pop in today and never come back at all. Once you have this information, you can really start doing something with your audience. People who visit your website over and over again over a long period of time are great potential customers. Let them know — even say thank you to them! For example — e-commerce sites. You can do different things. If you put that code on your site, you can re-market stuff to someone who has added things to the cart page. So in other words, they put stuff in the shopping cart and almost bought something, but they did not — they left before finishing the purchase. You can re-market to them via Facebook. Use your imagination, pay attention to the ads marketed to you and see how others are using this tool. Our MarketingforOwners.com/71 is a landing page. If you notice, there is no other navigation on this page. Your only options are to opt-in or leave the page. When you opt-in you will see a landing page. I recommend you go and check it out and opt-in to see how we have done things. It’s not going to hurt anything, and if you don’t like it, you can easily opt out after you have gotten your free booklet. You will be sent to a thank you page once you opt-in and download the book. That thank you page has the tracking pixel. Now if I know someone has gone to the landing page, but has not gone to the thank you page, they didn’t get the ebook. I can re-market to them. From this point, I will explain it to them again, and offer it to them again. Maybe they got distracted by a ringing phone or a dog barking, or even their kids started crying. You can re-market to those people who did something, but did not do it all the way. They visited a page, but they did not visit THAT page. You can re-market to people by the category. For instance, if someone visits my Fire Safety website and visits the smoke alarm category, then I can in turn re-market to them and let them know we also have fire blankets. I can also let them know that we sell small domestic fire extinguishers. They may have only looked at the smoke alarms, and not had time to look around at anything else. They didn’t realize what else we sold and what other products we carry. Think about this — We can craft all kinds of beautiful ads using Facebook. It is very very easy to do. You can create yourself a marketing budget so that you can do this. And — be sure to put your ad in the newsfeed and in the side bar because you are going to target these to the custom audiences you have built so you are not spending a fortune on Facebook ads. If you want even more in depth tips like these, be sure to subscribe to our Owners Club. Click here for 7 reasons why — the #1 most important reason? It’s free! 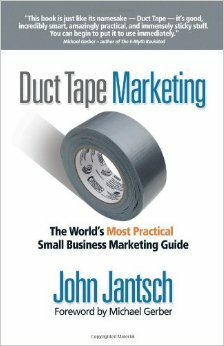 Today’s book recommendation is Duct Tape Marketing by John Jantsch. John is a genius of marketing systems. His system is based on the Marketing Hourglass instead of the Marketing Funnel. Seriously — if you don’t read this book and cannot figure out a great way of adding a new marketing technique to your systems and make money, then I will eat my hat. Duct Tape Marketing is fabulous and the author is amazing — not to mention that this book is extremely well written. Go get it and read it. Have you used Facebook Ads yet?